Today, we're talking all about "Transitional Style" and how to achieve a balanced transitional style in your kitchen. Transitional style combines the charm of traditional design and the simplicity of contemporary style for a finished product that appeals to a wide range of tastes, making it the perfect choice if you're renovating to list your home on the market or if you can't commit to just one style. Traditional kitchens have a bad reputation for being dark and dated, but when paired with more contemporary design elements, the result can be light and bright. Your countertop can set the mood for your entire kitchen, and is often the largest budget item in a kitchen renovation. 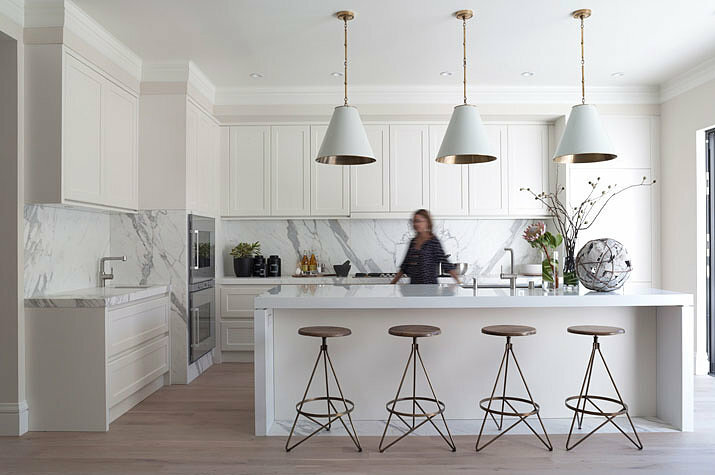 A lighter counter surface like marble can lend an airy feel to your space, while a darker surface like soapstone can still be used in a transitional design if well-balanced with lighter floors and cabinets. We love this Calacatta Vena Grigio or Imperial Danby to keep the foundation of your kitchen light. Our post about backsplashes can also show you how to add interest or make a visual impact with your backsplash choice. 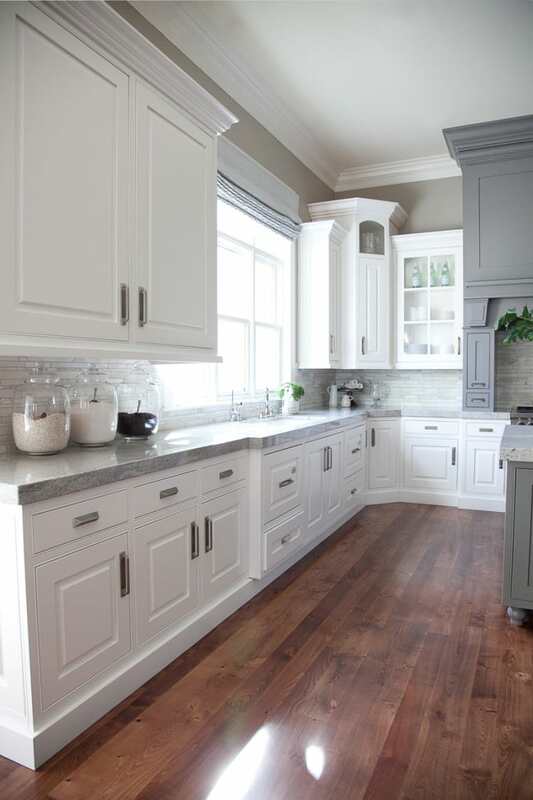 Use Shaker style cabinetry! The look of shaker cabinets is classic but can still read as a modern touch when paired with the right finishes. If you want to lean a bit more contemporary in your transitional design think about shaker doors without hardware to create a contemporary edge. Shaker cabinet doors are flush or inset with the kitchen design, giving a clean look to your kitchen. The kitchen is always the heart of the home, so keeping that in mind when designing your new space is important! Transitional design should incorporate plenty of natural light that allows contemporary design to shine. Stick with a shade of white or a light gray for a soft and sophisticated look in your space. Appliances and hardware are kitchen elements that can be used to help balance your overall design. If your cabinets lean a little more traditional, think about "handless" or no hardware cabinet doors; or, feature hardware that is sleek or in an unusual finish like copper. Appliances in new metallic finishes are becoming more popular, and can give your kitchen the contemporary push it needs to land in the transitional style zone. 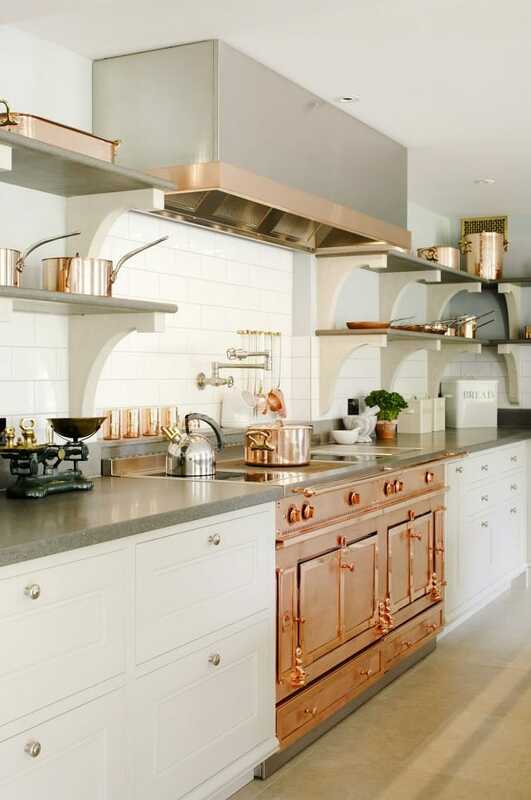 Look for appliance updates in metallics like rose gold to add a contemporary vibe to your kitchen, if needed. To achieve the transitional style, it's important to remember to keep the overall feeling "light and bright" by using your big ticket items like countertops and cabinets to anchor your space, then filling in design gaps with finishing touches like appliances and hardware for a transitional design that seamlessly blends both traditional and contemporary. For questions about transitional design or how to select the best counter surface for your space, don't hesitate to contact us.